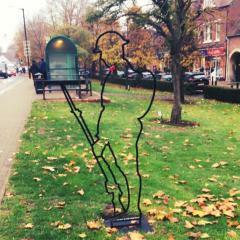 “I think it is wonderful that there are three Tommies in Harpenden. The three aims of the “There But Not There” campaign are to commemorate those who fell in the First World War, to help educate younger generations that we must continually search to find better ways of solving disputes than through war, and to help heal those injured in recent campaigns. The money raised from the sale of the Tommies will help charities working to help those injured in the Falklands, Bosnia, Iraq and Afghanistan. Thank you, Harpenden, for your brilliant support.” General The Lord Dannatt GCB CBE MC DL, Patron: “There But Not There”.